Another week of early voting has passed. In collaboration with the Associated Press Election Research Group, we are tracking at least 74,836 people who have voted in the 2016 election as of this weekend. (This is a data collection collaboration only: the analysis that follows is my opinion, and I likewise have no control over the Associated Press stories.) I say "at least" because some of the updates from states and localities are not recent and some do not publicly report at all. When you consider that over 130 million people will likely participate in the election, the 74,836 people who have voted early are a drop in the bucket. For this reason, it is important to reiterate as I stated last week, that these are the earliest of numbers. Much can change in the more than a month until Election Day. The numbers are affected by changes to state laws and nuances in how election officials run the election, the campaigns' tactics, and voters' behavior. The signals from these numbers are noisy, but will become clearer as Election Day approaches and the volume of early voting picks up. 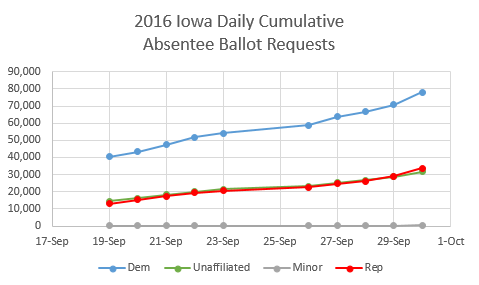 Iowa absentee ballot requests at first blush look very good for the Democrats. As of Friday, Sept. 29, registered Democrats lead registered Republicans by 44,435 requests, or 78,135 for Democrats to 33,700 for Republicans. The Democratic lead has been mounting daily, starting with a difference of 27,465 on Sept. 19, the first day the Iowa Secretary of State started publishing statistics. But in an indication of softness among Clinton supporters, the numbers from her party are down significantly from 2012, when 92,850 Democrats had requested ballots at this point, compared to 13,635 for Republicans. Obama won Iowa in 2008 and 2012 based on a strong early vote, despite losing the Election Day vote there. The Republican National Committee, which is heading much of Trump's get-out-the-vote effort, described the early numbers as evidence that Clinton's campaign is failing to inspire enthusiasm among voters. If a decline from 2012 is evidence for a campaign failing to inspire enthusiasm, the same can now be said about Trump's campaign. Republicans were running slightly ahead of their 2012 pace until Thursday, when registered Republican requests fell behind by 1,621 requests, and fell behind even further by 3,844 requests on Friday. I think the most reasonable explanation for these patterns is that the campaigns have not fully engaged voter mobilization efforts around Iowa absentee balloting and in-person early voting. At the end of early voting in 2012, the Democratic lead in ballot requests was 83,238. Projecting forward the growing Democratic lead in ballot requests would put Republican deficit at about the 2012 margin, in a state Obama won by 5.8 percentage points. However, I think it is unreasonable to project the growing Democratic lead in ballot requests out to Election Day. At some point, both parties will engage their voter mobilization efforts. If the past is a guide, these mobilization efforts will be observable when the parties mail absentee ballot requests to their supporters. It could be that the deficit the Democrats started with compared to 2012 is simply a result of the Democrats deciding to run their first absentee ballot drive later. Likewise, at some point, we should observe the Republicans absentee requests surge when their mobilization efforts take place. We don't have a lot of recent quality polling in Iowa. Polls showing a Trump lead were fielded over weeks, during a period of time of Clinton weakness in national and state polls. No post-debate poll has been released. The Iowa absentee ballot requests, like the polls, show Clinton currently has a greater challenge facing her in Iowa than Obama. However, this is a noisy signal and there are initial signs the early voting numbers are starting to turn against Trump. If anything, the numbers show crunch time for both parties is coming for Iowa, which may be closer than 2012. At first blush, it is Republicans who appear well-positioned in North Carolina. This week, registered Republican absentee ballot requests surpassed Democrats. The Republican margin now stands at 5,863, with the Republicans at 35,464 and Democrats at 29,601. This is to be expected. Unlike Iowa, Republicans traditionally do better than Democrats among North Carolina's mail ballots. The 2012 comparison, however, reveals continued weakness for Republicans and strength for Democrats. Republicans are now running at a deficit of 15,216 absentee ballot requests compared to 2012 while Democrats are running above by 4,549. 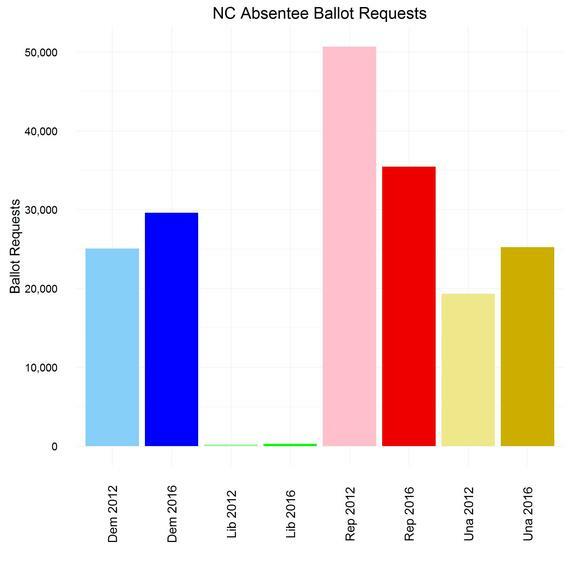 This is a consistent pattern evident throughout the absentee balloting period that started Sept. 9 in North Carolina. Romney won North Carolina by 2.0 percentage points. Four of the last six North Carolina polls have a small Clinton lead. It seems reasonable, then, that Trump is running behind Romney in North Carolina. How much remains a question. It is important to understand the mail ballots pale in comparison to the in-person early votes, which will number more than two million. The in-person early votes will truly tell the early voting tale. Democrats prefer in-person early voting. The legal battles over North Carolina's in-person early voting have been intense, and it is not a surprise that Democrats are now pleading with a court to increase early voting beyond what Republican-led local election boards were willing to provide. It could be that Democratic voters are taking a signal from the legal fight to cast their ballot by mail, but this would not explain why Republicans appear to be less engaged than 2012. Maine continues to be an interesting case. Statewide the early electorate looks similar to 2012, in a state Obama won 15.3 percentage points. Maine splits its Electoral College votes by congressional district, and Obama won the Second Congressional District by a more narrow 8.6 percentage points. 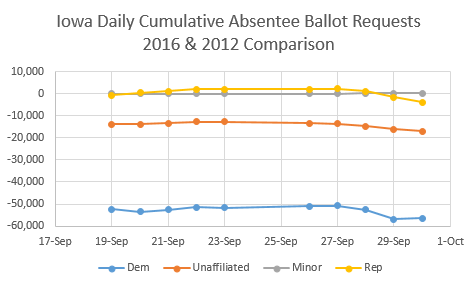 Statewide absentee ballot requests are down slightly from 2012 among registered Democrats, and up slightly among Republicans. This is probably not enough to upset the statewide vote. Drilling down to the Second Congressional District, the drop-off from 2012 among Democrats is larger. Will this be enough to split the Electoral College votes, as some polls suggest, is worth continued monitoring. I do not draw much from Florida or Ohio at this point in time, for similar reasons. Both states changed how they conduct mail balloting since 2012, making a comparison to 2012 difficult. In Florida, the state implemented a 2012 law that makes an absentee ballot request good for all elections through the calendar year of the second ensuing general election. Effectively, anyone requesting a mail ballot in 2014 or since was automatically added to the list of ballot requests for the November 8, 2016 election. This policy was unavailable prior to 2012, so it is impossible to make a reliable comparison to 2012. 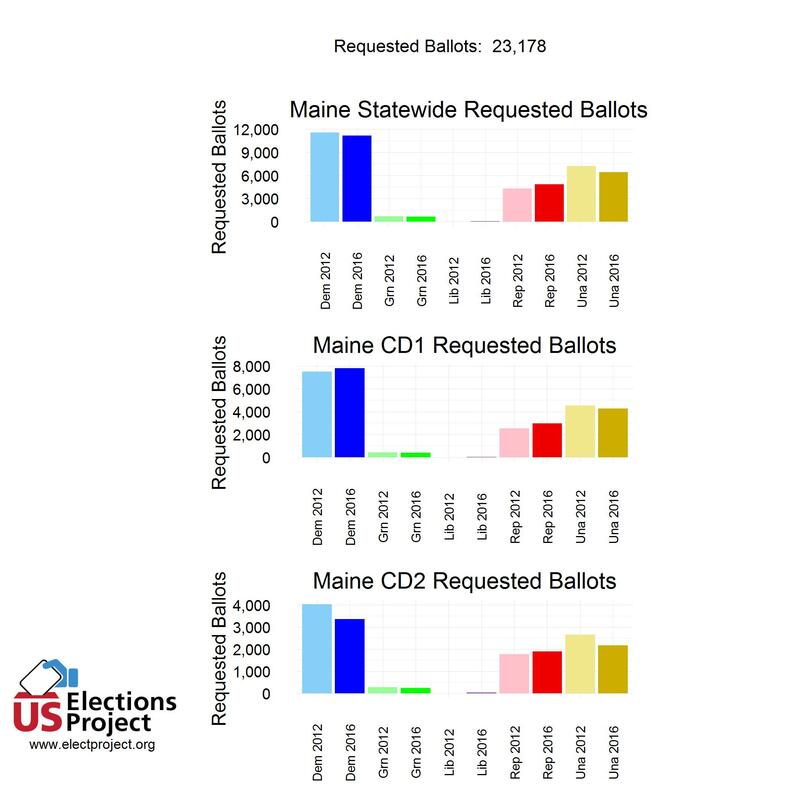 Out of the 2.3 million absentee ballot requests, registered Republicans currently lead Democrats by 144,930 requests, or 6.1 percentage points. Like North Carolina, this is to be expected. Florida Republicans tend to lead among mail voters, and Democrats tend to lead among in-person early voters. If registered Democrats took a lead among mail voters that would be noteworthy, but given the Republicans current margin, that seems highly unlikely. Without a good 2012 comparison, we'll have to wait until near closer to Election Day until for a clearer picture of Florida's early voting. Ohio's Secretary of State sent an absentee ballot request form to all registered voters who cast a ballot in 2012 or 2014. 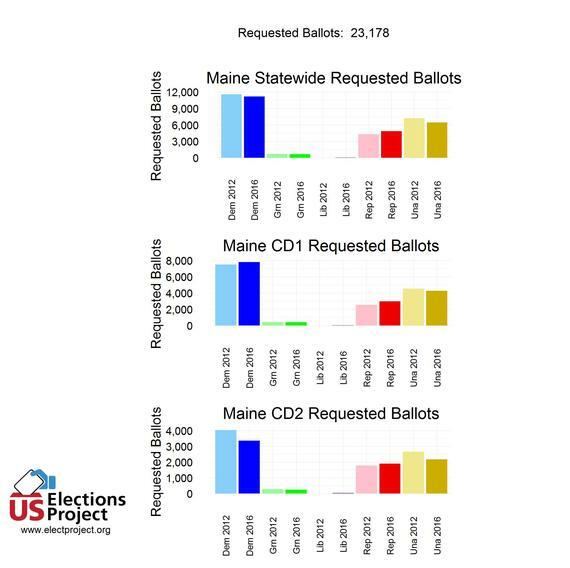 Not surprisingly, the absentee ballot requests are running about 82,000 more than the 2012 levels. There is another important caution to make about Ohio. Ohio requires a party loyalty oath for voters who participated in Ohio's open Republican primary. This is recorded in the Ohio voter file as voters' party. Since more Ohioans voted in the Republican presidential primary than the Democratic primary, that there are many more "Republicans" who are voting early is to be expected. Be cautious of spin from these data that indicates this means Trump is winning Ohio. Republicans put out similar spin in 2012, claiming Romney was poised for a landslide victory that never materialized. I track the 2016 early voting statistics here and post snap analysis on Twiiter @ElectProject. My analysis of last week's early voting is here.